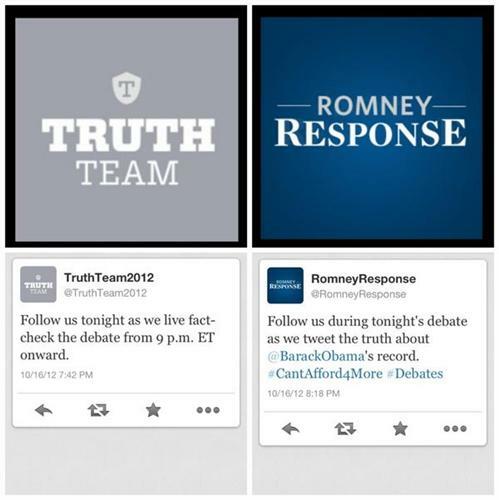 Follow along as we verify, dissect, and add context to the candidates' arguments. Both Michelle Obama and Ann Romney are wearing hot pink. Hmm last time Romney was asked about high cost of college, he told the student he should "shop around"
Best education system in the world? Only need to beat China, India and about 25 other countries. 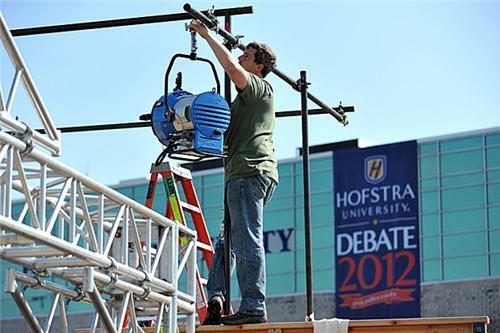 Romney's figure of 23 million Americans struggling to find work is generally correct. Labor Department figures show that about 12 million Americans are officially unemployed, 2.5 million are not looking for work for economic reasons (such as they don't think any jobs are available) and 8.6 million are working part-time because they can’t find a full-time job. That adds up to 23 million. Romney's right on that one. President Obama asserted that Gov. Romney wants to spend $2 trillion more on defense than the military is asking for. The fact of the matter is that President Obama has consistently targeted defense spending since his first budget, prioritizing domestic spending instead. The pressure from the White House was so strong that then-Secretary of Defense Gates said of the pressure on DoD, "that's math, not strategy." U.S. oil production reached a record high in 2011, with the United States producing more than 5 million barrels of oil a day according to the Energy Information Administration. That's up 5 percent from 2010, but according to some critics those gains came from development on private—not public—lands. According to a report released by the EIA this spring, oil production on federal lands actually dropped 14 percent from around 726 million barrels in 2010 to 626 million barrels in 2011, a decline Romney argues is due to the Obama administration drastically cutting permits for oil and gas exploration on federal lands. But while Romney might be right in pointing out the decrease in production on public lands, the figure needs more context. The 14 percent drop just represents the past year and doesn't adequately capture the overall trend in domestic oil production, experts say. Furthermore, the decrease in permitting isn't exclusively due to President Obama's policies as Romney has argued. Instead, "it is the result of decades and policies that have systematically reduced energy production on federal lands," according to CNN. A report released last week from investigative journalism nonprofit ProPublica found that while job retraining is one area that both candidates agree will help to create jobs, it may not necessarily help laid off workers find jobs. The report studied laid-off workers that were retrained at Blackhawk Technical College, a small two-year college in janesville, Wis., and compared them to their laid-off peers who were not retrained. It found that the retrained workers were in fact less able to find jobs than their counterparts. The report lays out several potential reasons for this—it could be that the best workers chose not to be retrained and instead continued on the job search. It may be that those workers who were not retrained took the available jobs while the other workers were being retrained. Or it could be that there is a lag between retraining and when those retrained workers find jobs. One expert says that retraining might help, but there is yet another curb that will keep some even well-trained workers in one industry out of the workforce. "Retraining could help, but the long term trend in manufacturing employment is down, and it will be difficult to reverse, largely as a result of technological improvements that replace workers with machines," says Gad Levanon, director of macroeconomic research at The Conference Board. It seems appropriate to point out that running a business, or running the Olympics, is completely different from running—or trying to run—the U.S. government. Romney still hasn’t spelled out how he would cut taxes at a time when the national debt is already alarmingly high, without making that problem worse. By saying, "of course the numbers will add up" then touting his business experience, he's basically saying that he'll run the government the way he has run a business. To give Romney the benefit of the doubt, here's one scenario in which his tax plan, as he has outlined it so far, might be a starting point for how his plan might lead to some kind of tax reform. But as they say in the military, no plan survives first contact with the enemy, and nowhere is that more true than in Washington. At a minimum, any tax reform Romney proposed would be thoroughly revised and mutated before it became law, which would most likely take years. #Romney looking shaky on this terrorism labeling issue. #Obama winning the Battle of Disgusted Looks.